Click the Link Below for a list of available churches with contact names or click the image below to browse the Directory of Churches. Hopewell OFWB is seeking a Full Time Pastor. Please click on the link to download an application. Location: Corner of Hwy 111 and Sarecta Rd., 3 miles North of Beulaville. White Hill OFWB Church is seeking a pastor who is called to preach and teach the Bible, to lead people to Christ, to encourage and motivate believers in their growth and service to God, and to visit the sick, shut-in and others in the community. White Hill is located at 9204 Old Sand Hill Road in Aurora, NC, which is approximately 24 miles from New Bern, 27 miles from Washington, and 42 miles from Greenville. Please submit resume with cover letter to smtoler@icloud.com or mail to White Hill OFWB Church, P. O. Box 519, Aurora, NC 27806. All responses will be handled in a confidential manner. Qualifications: The Pastor shall be a OFWB ordained minister in good standings with our conferences in the Original Free Will Baptists. (Good standings “include being of sound mental health, having high moral standards/character and being firm in Christian doctrine. If married, the Pastor’s family will be expected to fully support his ministry. The Pastor should have at least a baccalaureate degree from an accredited college or university. Winterville Free Will Baptist Church, of Winterville, North Carolina, is searching for a Senior Pastor whom God has chosen to lead us into the future. We are an Original FWB church located in a growing community with a congregation of 130. We are characterized by a strong commitment to God, fellowship, discipleship, missions and ministry, and we are searching for an individual of like faith and practice. If you sense God’s prompting you to pursue this opportunity, please send your resume and contact information to wfwbpastorsearch@gmail.com or mail to P.O. Box 209, Winterville, NC 28590.
is seeking Bi-vocational Pastor, located 604 E. Ash Street, Goldsboro. Branch Chapel Free Will Baptist Church, Selma NC, is prayerfully seeking a full-time Senior Pastor. “The pastor shall have general superintendence of the church as the chief administrative officer. It is the pastor’s duty to faithfully preach the Word, to be an example to the flock, to visit members-especially the sick-as he has opportunity; to do all within his power to promote the spiritual interest of the church which he serves to promote all denominational institutions, enterprises, and programs, and to advance the cause of Christ among men.”1 Our church currently offers a Sunday School hour (classes available for infants up to senior citizens), followed by a worship service and a Sunday evening worship service. On Wednesday evenings we have worship service as well as youth group meetings and children’s classes. Other ministries include: tv, radio, rest home, and truck stop ministries. Our church reaches youth through our annual Vacation Bible School, Youth Camp, and Christmas play; as well as ongoing youth programs which include Code Red, Blast, Upper Room, and two youth choirs. We reach out to our community by hosting our annual Give a Kid a Chance day and supporting programs such as First Priority, Trail Life, and American Heritage Girls. In addition to our youth choirs, we have an adult choir and praise band. Adults are able to participate in group ministries that include Men of Branch, Branch Chapel Ladies’ Group, Quilting Bees, and Senior Citizens monthly luncheons. We live stream all of our services as well as have an active website for members and visitors. In order to be considered qualified, the candidate will demonstrate his personal relationship with Christ, his passion to reach and evangelize the unsaved, and his ability to oversee the spiritual growth of believers. He must have the ability to communicate faith and beliefs through inspirational speaking skills based on scripture. In addition he must be able to provide oversight and servant leadership of our congregation, meet the denominational conference requirements, be willing to support church by laws, collaborate with our youth pastor and deacon board, and demonstrate the love of Jesus Christ to all. He will be evaluated based on the qualifications given in 1 Timothy 3:1-7, Titus 1:6-9, and 1 Peter 5:1-4; a man faithful in prayer and study of the Word of God who is seeking to be holy and see God’s will fulfilled through him and the congregation which he leads. He must be respected and of high character, spiritually minded and humble, and always willing to forgive. He will seek to be holy (1 Peter 1:15-16) and to fulfill the Great Commission (Matthew 28:18-20). ● One sermon – video or link to website or URL. Please answer the following questions and submit with your resume and video sermon. 1. Share with us your personal testimony/salvation experience and your call to the ministry. 2. How would you describe your leadership style? Give an example. 3. If married, how would you describe your wife’s supportive role in both your family and your ministry? 4. What are your views and level of participation in both home and foreign missions? What evangelistic tools do you use to bring people into the church? 5. What is your approach to counseling? What types of counseling are you trained and/or comfortable providing? How do you protect confidentiality? 6. What are your specific and regular practices regarding the spiritual disciplines (including personal prayer, Bible study, stewardship, learning, etc.)? 7. As Christians we are all held accountable. How do you believe a pastor should be held accountable to Biblical standards? What relationships in your life currently provide accountability for responsible attitudes and behavior? 8. Please explain your views and approach regarding church discipline as it relates to Biblical principles. Give an example based on your experience. 9. What are the Biblical responsibilities of deacons? As a pastor, how do you hold deacons accountable to those responsibilities? How do you relate to your deacon board when it comes to decision making for the church? Are there any distinctions between the deacons’ and the pastors’ responsibilities? 10. What do you consider, in the order of their importance, your chief duties as a pastor? How do you balance your work schedule and divide your time in the range of your responsibilities? 11. What strengths do you bring to the ministry and how do you use those to edify the church? Resumes are welcome and encouraged. AYDEN OFWB, LOCATED IN AYDEN, NC IS CURRENTLY SEEKING A PIANO/CHOIR DIRECTOR. THE CANDIDATE WOULD WORK WITH THE CHOIR AND SERVE DURING THE 9AM SERVICE PLUS OTHER SPECIAL OCCASIONS. OTHER DUTIES INCLUDE, ADULT CHOIR PRACTICE AND WORKING WITH A YOUTH CHOIR. 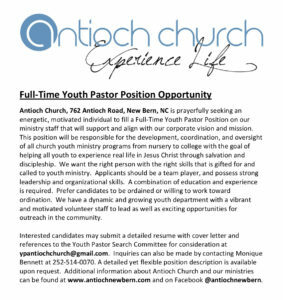 INTERESTED CANDIDATES PLEASE CONTACT REVEREND MICHAEL ROWELL AT 252-531-9151. The primary responsibility of the part-time worship leader (between 15-20 hours per week) will be to lead and grow the music worship ministry at First FWB Church in accordance with the vision of a modern/contemporary service geared toward connecting people to Christ through worship. In short, this person is expected to be gifted in leading congregational worship, working with vocalists and band members, possess good leadership, communication, and organizational skills, and be a team player. Work with the Lead Pastor in the planning of worship services that will fulfill the mission and vision of the church. Proficiency to lead worship both vocally and instrumentally (Guitar and/or Keys preferred). Planning music and leading the worship team and band for our 10:30am Sunday morning modern worship service and other worship services as needed. Be in charge of practice and rehearsals for vocalists and band members. Being able to give them the music and resources needed in advance and to be a clear and effective communicator. Be up to date on latest worship styles/songs with the ability to occasionally mix in more classic songs. Modeling and leading heartfelt worship in an invitational style – which draws people in, encourages participation, and points people to Jesus. Recruiting, teaching and training potential new worship team and band members to lead with excellence and humility. Administer the annual budget and spending plan for worship and music needs. Potential responsibilities may include preparing media and working with our A/V team to oversee AV/Production needs with a working knowledge of Pro Presenter software. A knowledge of modern worship applications such as multi-track, pads, Planning Center and Ableton-type programs is a plus. Please include 2-3 videos or audio examples (or links to view/download) that demonstrate your musicianship through leading worship.